Your First Law School Class – Saturday May 28/11 – 4:00 p.m. – 6:00 p.m.
“The Supreme Court of Canada is facing a significant “void” as two of its judges – Mr. Justice Ian Binnie and Madam Justice Louise Charron – announced their impending retirements. The Supreme Court is arguably the most important branch of government and the branch that people know the least about. On May 13, 2011 two Justices Binnie and Charron announced their retirements – giving Prime Minister Harper the opportunity to make two new appointments to the court. Those who are interested in the democratic process in Canada will note that these appointments are within the sole discretion of the Prime Minister. The judges appointed will be on the court long after Mr. Harper has retired. Retired University of Toronto Law professor Jacob Ziegel is one of many who believe that the process of appointing judges should be more open and democratic. (Those interested might find this article about judicial activism in India interesting.) The bottom line is that Mr. Harper, by appointing Supreme Court judges, will impact Canada far beyond his retirement. The judges that he appoints will be the real “Harper Legacy”. It is amazing to me that the issue of appointing judges was not an “election issue”. What Kind of Judges Will Prime Minister Harper Appoint? “We will pick, as we have done in the past, people we think are strong, independent legal minds,” said Harper. Participate in your first law school class! This will be an amazing event for any pre-law student. Philip Slayton is a former professor and dean of the law school at the University of Western Ontario. He also practiced for many years at a large Toronto law firm. 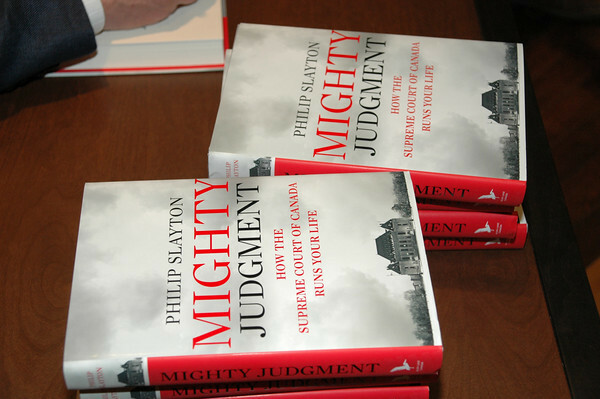 His book about the Supreme Court of Canada and the effect it has on Canadians – “Mighty Judgment” – has just been released. The book is MUST reading for law students. The book explores a number of Supreme Court of Canada decisions including the Sinclair decision which was released in 2010. 1. A discussion of the Supreme Court of Canada and why it matters. In fact with the advent of the recent Conservative majority, the Supreme Court of Canada is now the only opposition to the government. – print the case and bring a copy with you. (Although you would not want to do this, you will find some discussion of the Sinclair case on pages 106 – 108 of “Mighty Judgment”.) Note that you can bring your laptop to access it as as pdf. A summary of the case from the Supreme Court of Canada may be found here. Professor Slayton is also the author of “Lawyers Gone Bad” , written by a lawyer, about lawyers, for the general public, ignited controversy in the legal profession. Meet Philip Slayton here . This event is available free to all Richardson LSAT preparation course students (past and present). For others it is $10 payable at the door.